Costa Cruises’ mammoth new flagship, Costa Diadema, dubbed Regina del Mediterraneo — the Queen of the Mediterranean — launched in late 2014 and now sails weeklong cruises to ports in Italy, France, and Spain. “Diadema,” in fact, comes from the Italian word for tiara, accentuating its role as the crown jewel of Costa’s 16-ship fleet. Of course, on a ship this size — the 15-deck Costa Diadema has a maximum passenger capacity of just under 5,000, with 1,253 crewmembers — some non-Italian elements inevitably intrude. Safety drills are announced in multiple languages (including English), a specialty restaurant serves up Asian-style dishes, a beer hall evokes images of Bavaria, and the Country Rock Club tosses a rockabilly nod to Memphis, Tennessee. 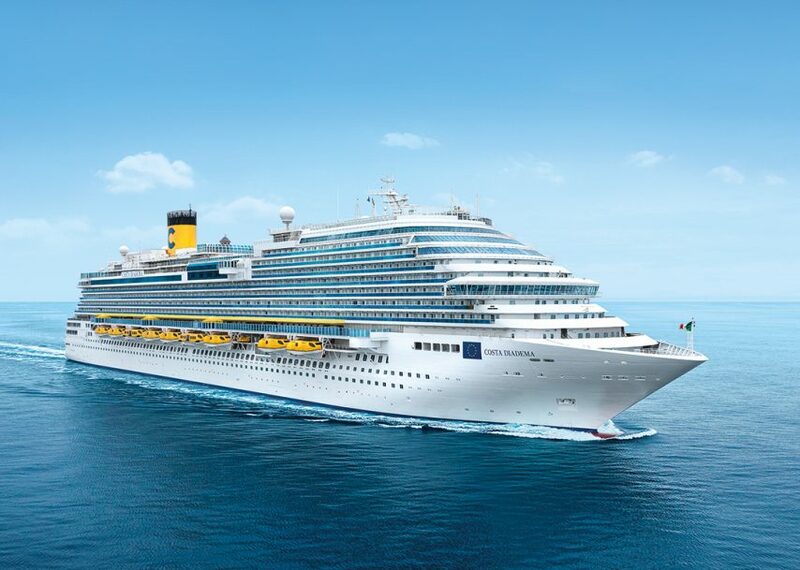 While these elements reflect the international makeup of the passengers, who range from Europeans to Chinese to Americans, make no mistake: Costa Cruises seeks to offer its guests a true Italian experience. “We are Italians,” emphasizes Neil Palomba, president of Costa Crociere in Genoa. 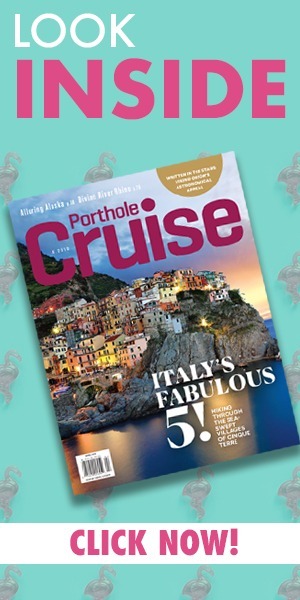 “We need to distinguish ourselves and that’s to offer Italy’s finest.” To drive the point home, Costa executives point to the ship’s Italian flag, its all-Italian officer corps, and its onboard pizzeria, focacceria, and gelateria. So if you’re looking for an Italian experience in the Mediterranean on the biggest, most spacious, and most modern ship from Italy’s largest cruise line, Costa Diadema wishes you benvenuto! Like any megaship, it might take some time to get your bearings aboard Costa Diadema. Enter via a soaring, uber-colorful atrium — recognizable as the work of legendary (some say over-the-top) ship designer Joe Farcus — while glassed-in elevators whisk you between decks. Long, twisting passageways lead forward and aft, where you’ll encounter some of the more than 7,000 pieces of modern art (most of it Italian). And if you ever lose your sense of direction, illuminated signs will become your compass and guide you down the passageways. You can also simply follow the crowds to the ship’s central gathering places. Deck 10 boasts two pools: the main pool comes with a retractable glass roof, and a smaller open-air pool complete with deck chairs, hot tubs, and a few nearby tables is at the ship’s stern. The ever-bustling dual buffets fill the space between the two pools. Deck 4 features a mega-shopping plaza, while Deck 5 includes a number of indoor eateries, bars, and the centrally situated casino, where a battalion of slot machines call out to passersby. Deck 5’s most striking feature, however, is a wraparound one-third-mile-long promenade that offers bracing views of the Mediterranean. If you want to take a breather or just relax, duck into one of six enclosed sea-view cabanas or one of two hot tubs that extend over the sides of the ship. Or drop into the gelateria to sample 18 flavors of rich Italian ice cream. You’ll find plenty of additional outside lounging space and a jogging track on the upper decks as well. Costa Diadema doesn’t try to compete with the high-tech, jaw-dropping innovations found on some other large cruise ships. But its variety of activity and entertainment is apparent and includes a two-level disco, a 4D cinema, a library with Internet stations, a cigar lounge, a basketball court, and a tempting outdoor kids’ play area with a mini castle, sailing ship, and kiddie pool (there’s a kids’ club, too). Older kids can find companionship and action in the teens’ club and arcade as well as a Grand Prix racing car simulator and even a laser maze — a modern-day labyrinth requiring the flexibility to wend your way through a laser-beam obstacle course. The sprawling four-deck, 67,000-square-foot Samsara Spa commands a sea view from the top decks. Passengers have free use of the gym or can purchase daily or weekly passes to enter the Thalassotherapy pool, sauna, teahouse, and solarium. Spa splurges may include Balinese massages, aroma stone therapies, and facials. Most cabins are equipped with twin beds that convert to queen size, as well as desks, roomy closet space, sitting areas, and satellite TVs (which carry one or two English-language channels). Suites are a pronounced step or two up in stylishness and amenities as well as size. Some 141 spa cabins and suites, located near the spa entrance on Deck 12, tend to be quieter than those on lower decks. Spa cabin packages come with spa admission privileges (including a few treatments), as well as luxuriant bath accessories. Italians treat eating as an art form, and Costa Diadema offers its own artistic flourishes. The buffets buzz at “The Traditional Italian Breakfast” and “The Italian Lunch,” as they’re described in the daily bulletins. This translates to a sea of pastries, breads, and cold meats at breakfast, and various pastas — some made to order — along with salads or a mix of meat and fish dishes at midday. (Hamburgers and fries, now a global staple, are served near the pool.) Meanwhile, the table-service Fiorentino restaurant caters to those seeking an “international” — otherwise known as “hot” — breakfast or more leisurely lunch. If you’re willing to pay extra for fine Italian cuisine or showmanship, you can try the upscale Club Diadema or the Teppanyaki restaurant, where Japanese-style chefs flip knives around and grill up tasty beef, seafood, and vegetables. The Neapolitan-style pizzeria and the Samsara restaurant with its lighter spa fare are additional options. And, in a first for the line, the casual Corona Blu restaurant allows passengers to come and go and dine with whomever they please during the evening hours. Of the ship’s 11 bars, a number are themed, most notably the two-level Bavarian-style beer hall, a classy vinoteca (wine bar), and a Prosecco bar (a Venetian-style Spritz made with Prosecco is a ship specialty). A piano bar and the Country Rock Club provide their own brands of mood music along with a variety of libations. The tri-level Emerald Theater, which hosts evening entertainment, tends to fill up quickly, leaving lingering arrivals to hunt for seats on the far ends. The eclectic line-up may include musical revues, acrobatic acts, and Italian-flavored performances that weave together fashion, dance, and opera. The disco draws a mostly younger crowd, the Country Rock Club offers line-dancing lessons, and the late-night rhythms at the centrally located Grand Bar Orlov attract dancers of all ages and styles. Unlike most traditional cruises, Costa Diadema embarks and disembarks passengers at several ports during the week. For instance, you might start and end your cruise in Savona, Italy, while your (temporarily) fellow passengers start and end in Marseilles, France, or Barcelona, Spain. This system has the decided advantage of limiting the number of passengers embarking or disembarking on the same day. It has the disadvantage of requiring several new safety drills during the week for each new set of embarking passengers —meaning that late afternoons are often dominated by multi-language announcements directing passengers to head to their muster stations. Costa is clearly putting a pronounced premium on safety, so it’s hard to complain when your favorite bar turns into a sea of orange lifejackets during aperitivo hour. But the first dinner seating isn’t until 7 pm, so there’s plenty of time to toast your good fortune to being aboard the very Italian Queen of the Mediterranean. Salute!